The children foil a terrible plot and cause destruction! An adventure on the farm railway. 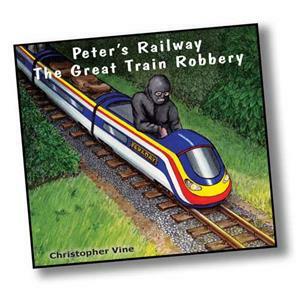 The book explores how they have protected the railway, including a home-made burglar alarm. This is put to the test in the story and is also explained in a simple technical page. At the end of the adventure the children are presented with a huge reward! Paperback, 48 pages with 12 watercolour pictures. Peter and Grandpa’s little steam railway originally ran across the farm between their houses and the village of Yockletts. But recently, (Peter’s Railway Hits the Jackpot, Book 5), they have extended the railway, by five miles, to Oaksted village. The new line includes a bridge over the River Wye and a long and curving tunnel under Gorse Hill, not far from Peter’s house. This story is an adventure set on their miniature railway.